When I was contemplating new flavors for doughnuts, the cupcake craze came to mind, particularly chocolate ganache cupcakes. You can dip these doughnuts into the ganache, but you can also double the filling recipe and squeeze some inside the center of each doughnut as well. In a large bowl, place the yeast, warm water and 1 teaspoon sugar and stir. Let the mixture sit for 10 minutes, or until thick. Add the remaining sugar, soy milk, margarine, egg, salt, vanilla, cocoa, and 1 cup (125g) flour and mix on low speed either with a with a dough hook in a stand mixer or with a wooden spoon. Add another ¼ cup (30g) flour and mix well. Scrape down the sides of the bowl. Add another ¼ cup (30g) flour and mix again. If the dough is still sticky, add more flour, if needed, a tablespoon at a time, and mix it into the dough until it becomes smooth, but not sticky. Each time you add flour to the dough, make sure you mix it in thoroughly, so that it’s well integrated. You don’t want to see any white patches of flour before you add more to the dough. Cover the dough with a clean dishtowel and let rise for one hour in a warm place. I use a warming drawer on a low setting, or you can turn your oven on to its lowest setting, wait until the oven reaches that temperature, place the bowl in the oven, and turn off the oven. Dust a cookie sheet with some flour. Sprinkle some flour on your counter or a piece of parchment and roll the dough out until it’s about ½ inch (1.25cm) thick. Use a 3-inch (8-cm) round cookie cutter or drinking glass to cut out circles and place them on the prepared cookie sheets. Reroll any scraps. Cover the doughnuts with the towel. Place the cookie sheet back in the oven (warm but turned off) or warming drawer. Let the doughnuts rise for 45 minutes. Heat 1 ½ inches (4cm) of oil in a medium saucepan for a few minutes and use a candy thermometer to see when the temperature stays between 365ºF and 370ºF (185°C and 188°C); adjust the flame until the oil stays in that temperature range. Cover a cookie sheet with foil. Place a wire rack on top and set it down near your stovetop. Add the doughnuts, no more than five at a time, top side down into the oil and cook for 1 ½ minutes. Use tongs or chopsticks to turn the doughnut over and cook another 1 ½ minutes. Remove the doughnuts with a slotted spoon, letting any excess oil drip off, and place them on the wire rack to cool. Repeat for the remaining doughnuts. Break the chocolate into small pieces and melt it in a double boiler or in the microwave oven for 45 seconds, then stir; heat again for 30 seconds and stir. Heat for another 15 seconds and stir until melted. Heat the soy milk until it’s hot, not boiling. Whisk it into the chocolate mixture a little at a time and then whisk it again after each addition. Add the confectioners’ sugar and mix. Add the margarine and whisk well. If the chocolate ganache hardens, heat it in the microwave for a few seconds and stir. 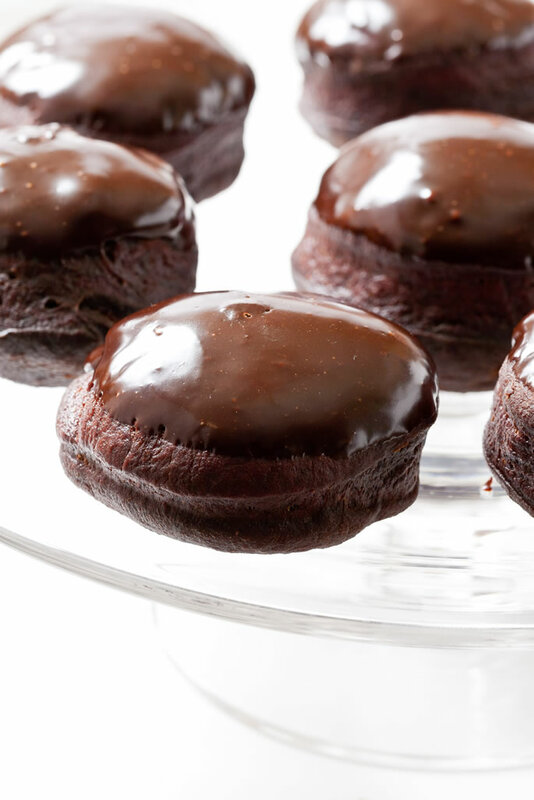 Dip the smooth side of the doughnut into the ganache and swoosh it around a few times for a generous coating on one side, and then lift it out of the ganache. Eat the doughnuts immediately or store them covered at room temperature for up to one day. Reheat to serve. Paula Shoyer is a French-trained chef, worldwide cooking teacher, and mother of four. She is the author of The Healthy Jewish Kitchen (2017), The New Passover Menu (2015), The Holiday Kosher Baker (2013), and The Kosher Baker (2010). This recipe is excerpted from The Holiday Kosher Baker, photography by Michael Bennet Kress.